· Thanks to Packt Publishing team and author “Kamalakannan Elangovan” for forwarding me this book for review. · Difference between AX2009 and AX2012 reports. · Customization of Standard AX2012 Reports. · Create Reports using Report Data Provider, EnumProviders. · Customizing the parameters using UIBuilder. · Understanding Integration with External data sources. · Design complex report like matrix, charts, Sub reports. etc. 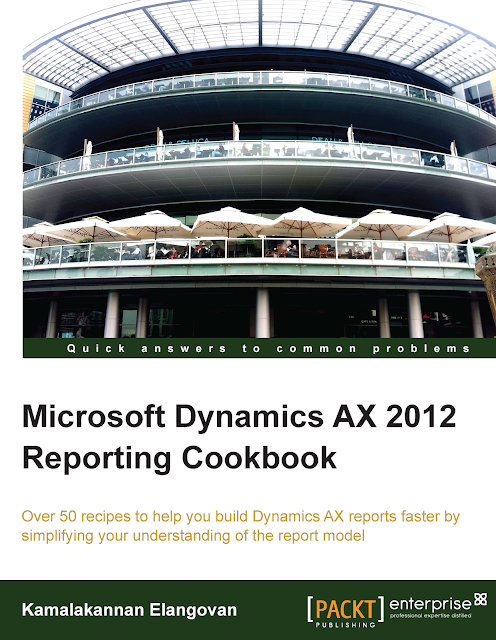 This title is for all Technical consultants, who want to take full advantage of the features of Dynamics AX 2012 Reports. I know Kamalakannan Elangovan as fellow bloggers on Dynamics AX. Kamalakannan Elangovan has over eight years of development experience in Dynamics AX. He shares a passion for product development and has pioneered multiple ISV solutions on Dynamics AX. In the past he worked with Innovites to create the first multidimensional ISV solution for cable industries called "Innovites for cable". Building the solution from scratch, he has gained great insights into building, selling, and promoting the product among customers and partners in the Microsoft Ecosystem. You can learn more about him at http://about.me/casperkamal. He is enthusiastic about sharing his learning with the community which led him to create one of the first few blogs for AX in 2006. It is currently available at http://kamalblogs.wordpress.com. He is active through twitter and the community, popularly by his pseudonym Casperkamal.